Spark R&D, a company out of Bozeman, MT, has been making splitboard bindings for over a decade, and they have produced some of the most durable splitboarding components on the market — my first set of splitboard-specific bindings were the 10/11 Spark Blaze, and I am happy to report they are still very much operational after riding close to 100 days a year for 5 seasons. Still, Spark has come a long way since their first Ignition Binding in 2006, and their new 17/18 Arc and Surge bindings represent the most recent steps forward for the brand. 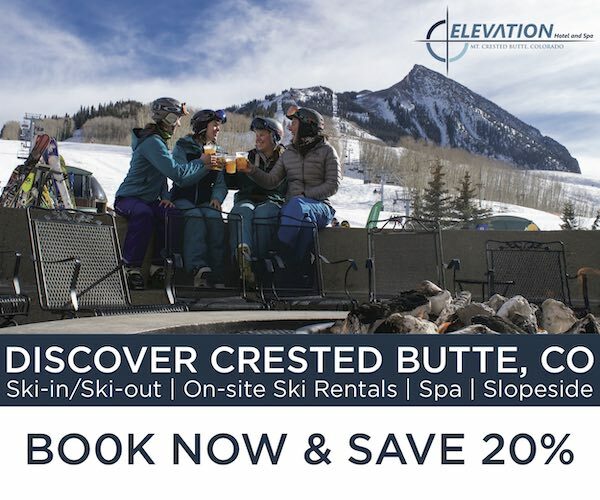 Although slightly heavier than the Arc, the Surge is positioned as the pinnacle of the Spark lineup, providing the stiffest and most dynamic ride, which puts it in direct competition with another light, stiff binding — the Karakoram Prime Carbon. One of the things that I have always liked most about Spark splitboard bindings is the simplicity of their design, particularly in transitioning between ride and tour modes. I spend quite a few days in the backcountry in the harsh climates of Alaska, and that has made me an advocate of simplicity — simple designs seem to last longer, endure more punishment, and can be relatively easy to service. While performance is sometimes sacrificed by creating a simpler, more user-friendly platform, the Surge executes this balance of simplicity and performance very well. New for the 17/18 Surge binding is its “Pillow Line” strap. Made of a relatively hard (compared to the Karakoram Air-Form straps), semi-elastic plastic, the straps shave a lot of weight off the 16/17 Surge. While it might not be solely due to the new plastic straps, the new 17/18 Surge has a stated weight that’s 125 g lower than the previous version. Although the straps lack padding, they contain small “pillow” indentations that mold around the boot very well and remain surprisingly comfortable on long trips. The pillow structure gives the harder plastic the ability to mold well while remaining stiff, responsive, and (hopefully) more durable. The straps were allegedly shaped based off the 3D scans of popular boots, ensuring a tight, secure fit. The plastic also helps shed snow and slush, keeping the straps remarkably light throughout the whole day. The straps have a stated weight of only 40 g per ankle strap (claimed to be 43% lighter than last year’s), and 16 g per toe strap (68% lighter). Spark’s “Tesla System” remains the same as the last couple years — with an easy flip of the metal bracket under the toe, the binding can be attached/detached from the touring bracket and pucks when riding. The Surge remains compatible with all the older Voile / Spark puck versions, as well as the newer metal and canted (angled 3 degrees towards the center of the board for a more natural and comfortable stance) Spark mounting pucks. The single T1 climbing wire offers a high and low setting (18 & 12 degrees) for easy touring. I have always been a big advocate of the wire heel lifts, as once again, sometimes simple is best. The T1 wire is located on the binding, under the heel, and is made easily accessible with Spark’s “Whammy Bar” — a metal spur that sticks off the side of the binding allowing for easy engagement with a ski pole. All of Spark’s 17/18 bindings now come standard with the Whammy Bar, which was previously sold as a separate accessory. The Spark climbing wire design seems solid and slightly easier to use than the plastic heel lifts of Karakoram’s splitboard bindings. Whether it’s an issue with my touring style or not, I’ve had problems with the heel risers on the Karakoram Prime Carbon wearing out and collapsing. I have never had negative experiences with the wires on the Surge, although it is not quite fair to compare the two yet since I have only spent 7 days on the Surge and well over 125+ days on the Prime Carbon. I will be sure to update the review once I have spent more time with the T1 wires on the Surge. 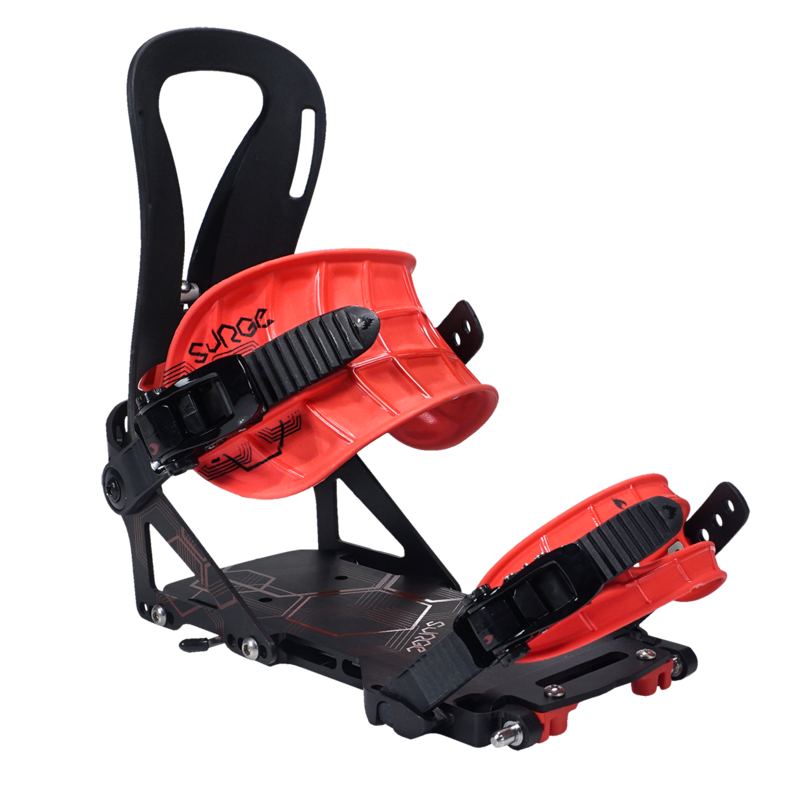 The Surge is also compatible with Spark’s T1 heel lockers, a device mounted on the board to lock the heel of the binding down when skiing for more control while descending with the board in ski mode. The Surge’s “Rip N Flip” fiberglass highbacks are stiffer than those on the Arc, but utilize the same forward lean adjuster to easily switch from a ride mode forward lean that can be set from 0-22 degrees to a very slack -13 degree touring position. The slacked touring position allows for longer strides, and thus more efficient skinning. As with the Pillow Straps, Spark used 3D modeling of common boots to ensure the highback fits snug and comfortable. The Surge is compatible with Spark’s Ibex aluminum crampon, which can be installed or removed without unstrapping. The Surge tours exceptionally well. 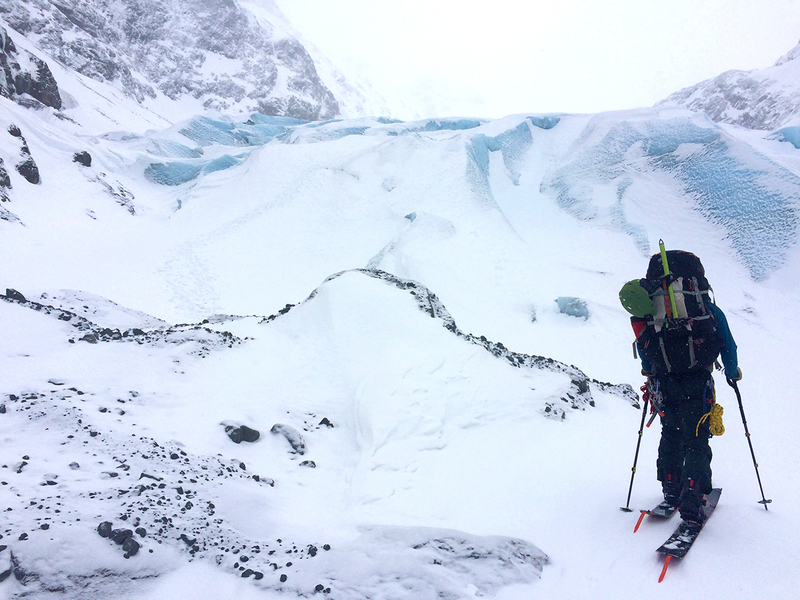 While I have only spent a few days on the bindings, the days felt long while wearing a pack filled with gear for multiple days and glacier travel. 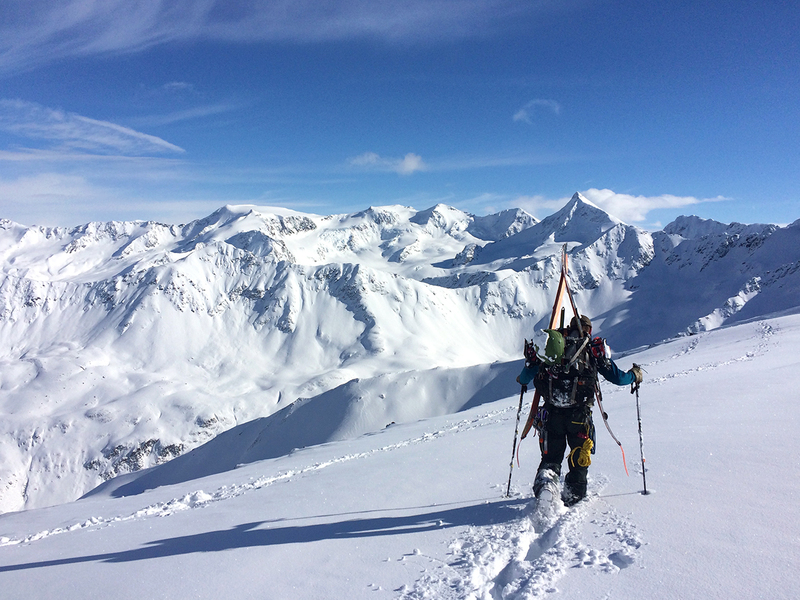 Multi-day tours seem to be the best way to assess splitboard equipments’ touring performance — you have heavy packs that magnify any inefficiencies in stride or edging mixed with a couple days of fatigue. While completing a ~30 mile segment of the Eklutna Traverse in the Chugach Mountains, I had ample time to critique the bindings, from the 12 miles of relatively flat lake and glacier touring to much steeper climbs on variable snow and semi-exposed blue glacial ice. A few key differences stood out when comparing the Spark Surge to the Karakoram Prime Carbon bindings. Although I have had considerable issues with the older generation Karakoram Heel lifts collapsing (particularly on hard pack), I felt as though I was able to edge better / apply more edge pressure when side hilling on firm conditions than the T1 wires on the Surge. Board selection may have more to do with it than anything, and I am looking forward to testing both bindings on the same board and slope to confirm or disregard such suspicions. Both Karakoram and Spark offer a way to secure the upper cuff of the boot to the top of the highback. Spark offers a velcro “Strappy Strap” to increase the lateral support when touring, which is similar to Karakoram’s “Flex-lock” system. These options have proven to be very useful on hardpack, particularly with a heavy pack on. NEXT: Transition / Board Interface, Riding, Etc. Hi Andrew. Great review. Do you have any updates on the Surge or any additional feedback yet? I just upgraded my 2011 Blazes with the new Surge and I’m curious about the construction, dependability, etc. I’m concerned about certain parts of the new Surge, but they’re simply based on my initial observations. I haven’t ridden them yet.